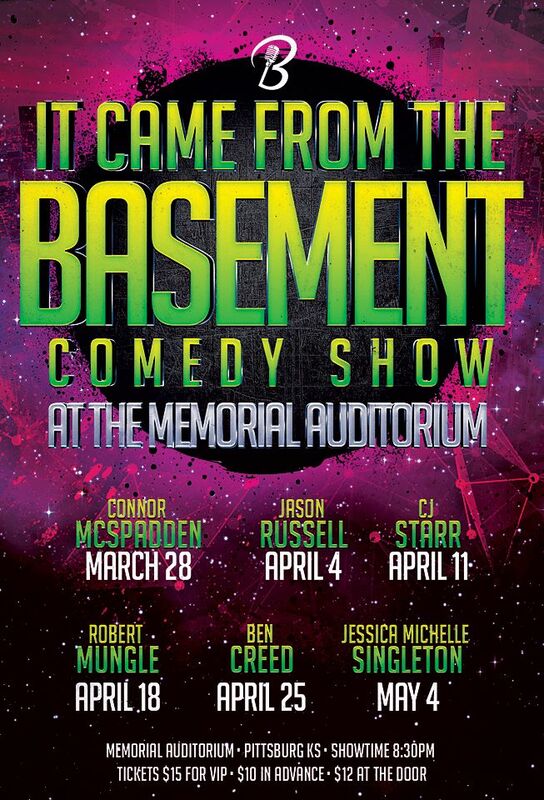 The Pittsburg Memorial Auditorium has announced a new comedy series, titled It Came from the Basement. The string of shows begins 8:30 pm Wednesday, March 28, and consists of six 90-minute acts, featuring national touring stand-up comedians. Performances are suited for audiences 18 years of age and older. It Came from the Basement gets its unusual name from the venue – the lower level (or basement) of the Memorial Auditorium. This space, which often hosts banquets, conventions, exhibitions and numerous other events, will be transformed into a 200-seat comedy club for this unique series. Memorial Auditorium General Manager Chris Patterson is utilizing the space in creative ways to attract comedy acts and other performers to Pittsburg. Patterson says he is expecting this comedy series to open up new downtown entertainment and nightlife options in Pittsburg. The series runs every week, from Wednesday, March 28, to Thursday, May 3. Each night will feature a headliner and supporting act. The first comedy act is Connor McSpadden with special guest, Kameron Johnson, Wednesday, March 28, at 8:30 pm. Next up will be Jason Russel with special guest Ryan Green, Wednesday, April 4, at 8:30 pm. The following performance is from CJ Starr with special guest Lauren Turner, Wednesday, April 11, at 8:30 pm. Next will be Robert L. Mungle and special guest Meghan Welch, Wednesday, April 18, at 8:30 pm. The series continues with Ben Creed and special guest Dave Short, Wednesday, April 25, at 8:30 pm. The series will conclude with Jessica Michelle Singleton with special guest Olivia Grace. Thursday, May 3, at 8:30 pm. Ticket prices are $60 for a VIP table for four ($15 each), $10 general admission in advance, and $12 general admission at the door. Tickets can be purchased online at www.memorialauditorium.org, by phone at (620) 231-7827, or in person at the Memorial Auditorium box office.